Meet Marie Beunaiche, returning student who made the leap from a job with no opportunities to following her goal of working in aviation maintenance. The Aviation Maintenance Technology (AMT) Program provides an opportunity for students to gain the skills needed to work in a number of Airframe and/or Powerplant (A&P) careers. Conveniently located in a well-equipped facility adjacent to the Oakland International Airport. Always wanted to work with planes? Through the College of Alameda you can! The Aviation Maintenance Technology (AMT) Program provides an opportunity for students to gain the skills needed to work in a number of A&P careers. Conveniently located in a well-equipped facility adjacent to the Oakland International Airport. Certificates of Achievement – You can choose a path in either Airframe or Powerplant mechanics, and will receive a Certificate of Achievement in your pathway when you have passed all of the course requirements. A.S. Degree – Students can graduate with an A.S. in Aviation Maintenance Technology with the completion of the General Education coursework in addition to the AMT coursework. FAA Licenses – The courses are approved by the Federal Aviation Administration and will also prepare you to take the FAA exams. Passing the coursework and the appropriate exams will qualify you for an Airframe and Powerplant Mechanic License as well as a General Radiotelephone License. 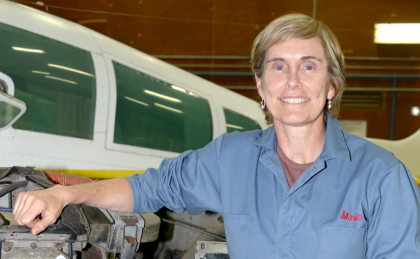 Marie Beunaiche, a student at College of Alameda’s Aviation Maintenance Technology Program was recently awarded a $1,500 scholarship from the Northern California Business Aviation Association, NCBAA. Ms. Beunaiche is a reentry student seeking a second career. This scholarship was awarded through Snap-On to help Marie purchase tools needed for the AMT program. Along with the scholarship came mentoring from members of NCBAA to help Marie succeed in aviation maintenance. Congratulations Marie on your achievement of this honor in the Aviation Maintenance Technology Program at College of Alameda.